This book explores the connection between one’s attitude toward his/her job responsibilities and one’s ultimate performance. It makes the case that a person’s performance is 80% their attitude toward their job, and only 20% their technical skill level and knowledge. 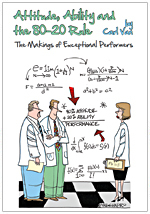 Many real-life examples are provided where an individual’s performance was either improved or diminished simply based on how they described their job. This is explored in detail in the area of customer service. Attitude is separated into two main sections: Attitude is Performance; Attitude is Job Satisfaction. Both sections make the case that an individual's performance is more closely linked to how they perceive and describe their job than what they know or what they can do. The author relies on years of observations, monitoring phone calls and conducting training sessions to draw his conclusions.